We helped increase their user conversion ratio to 80%, by delivering the stellar Mobile App. This case study narrates how Andolasoft helped Auditnet to monetize by delivering a mobile application. AuditNet serves the global audit community as the primary communications resource with an online digital network where auditors share resources, tools, and experiences including audit work programs and other audit documentation. They had a Web Application designed to handle larger user base and online payments for the subscription plans. Due to the growth of smartphone application usages, there was an opportunity for AuditNet to attract smartphone users looking for audit application. Also the smartphone application would help the existing users to seamlessly access the audit tools/contents inside their smartphone application without need to browsing the website. Andolasoft helped AuditNet to analyse the audit industry and the website for the smartphone application development. Andolasoft proposed a solution for AuditNet to develop a smartphone application for all the major mobile platforms like iOS, Android and Windows. Andolasoft developed the mobile app and the backend API endpoints which communicates with the AuditNet web platform, completed in 10 weeks of the timeframe. Andolasoft also helped AuditNet to place the smartphone application on the respective market places for iOS, Android and Windows. For iOS, Apple’s inApp purchase is implemented whereas for Android & Windows platform PayPal was integrated. The mobile app facilitated to download the audit templates/tools and access the same from the app itself. 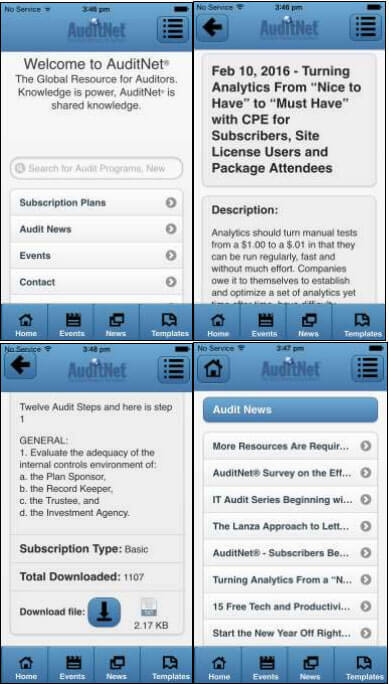 The smartphone app developed by Andolasoft helped the AuditNet customers to use the Audit templates/tools easily. Due to the integrated payment system users are also able to renew/upgrade the subscription plans seamlessly. Summarily, the mobile app increased the user conversion ratio of AuditNet to 80%.